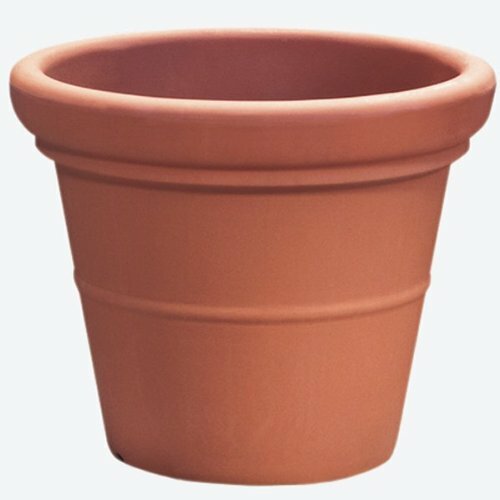 Akro Mils TEA25000E35 24'' Terracotta Terrazzo Planters by Akro-Mils Lawn & Garden at Tulips Orchids. MPN: TEA25000E35. Hurry! Limited time offer. Offer valid only while supplies last. TEA25000E35 Color: Terra Cotta, Size: 20'' H x 24'' W x 24'' D Features: Material: -Plastic. Shape: -Round. Drainage Holes: -Yes. Water Resistant: -Yes. TEA25000E35 Color: Terra Cotta, Size: 20" H x 24" W x 24" D Features: Material: -Plastic. Shape: -Round. Drainage Holes: -Yes. Water Resistant: -Yes. Country of Manufacture: -United States. -Made in USA. Dimensions: Hanging Length: -24". -20" H x 24" W x 24" D: 7-1/4" diameter x 16-1/4" depth. -16.5" H x 20" W x 20" D: 21" diameter x 20" depth. Size 16.5" H x 20" W x 20" D - Overall Height - Top to Bottom: -16.5". Size 16.5" H x 20" W x 20" D - Overall Width - Side to Side: -20". Size 16.5" H x 20" W x 20" D - Overall Depth - Front to Back: -20". Size 16.5" H x 20" W x 20" D - Overall Product Weight: -4.38 lbs. Size 20" H x 24" W x 24" D - Overall Height - Top to Bottom: -20". Size 20" H x 24" W x 24" D - Overall Width - Side to Side: -24". Size 20" H x 24" W x 24" D - Overall Depth - Front to Back: -24". Size 20" H x 24" W x 24" D - Overall Product Weight: -5.9 lbs. If you have any questions about this product by Akro-Mils Lawn & Garden, contact us by completing and submitting the form below. If you are looking for a specif part number, please include it with your message.